Do you have Searchsquared Toolbar on your system and are still wondering whether you could trust it and keep it onto your computer? It should be said that it is not a very serious threat itself so there is no rush to remove it. However, it is known that it is going to add a new search engine to all the most popular browsers, including Internet Explorer, Google Chrome, and Mozilla Firefox. It not only brings a new search engine, but also changes your default one, which might be rather annoying. You should remove Searchsquared Toolbar if you want to use the search engine which you are accustomed to. It has been found out that Searchsquared Toolbar usually comes bundled with freeware and shareware. These are the applications which you can easily access on the web and download on your system. When you start the installation and do not pay enough attention to the installation process itself, it is very probable that you will end up with various unnecessary programs on your system. Our specialists have found out that Searchsquared Toolbar might come together with advertising-supported programs as well. 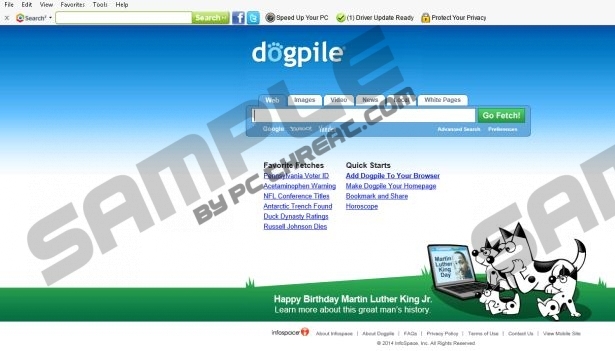 If you try to use the search engine which Searchsquared Toolbar sets, you will notice that you are redirected to DogPile.com. This search looks decent; however, if you try to enter any of the search queries to the search box, you will notice that the results which are provided for you contain several advertisements. They are displayed under the section Ads, which means that you are allowed to choose whether you want to click on them and look through. You should not trust these ads because clicking on them might lead you to the websites whose content is unknown or even malicious. If you are not sure whether you have Searchsquared Toolbar on your system, you should know that there are several features which will help you to recognize it. First of all, there is a search box which will allow you to search the web straight from your toolbar. Also, you will be able to access Facebook and Twitter by clicking on their icons placed on the toolbar. Finally, you will notice that your search engine has been changed to Searchsquared. You can remove it anytime if you do not like any of its features. Have you decided to erase Searchsquared Toolbar? Use the manual removal instructions which we have provided for you below and you will experience no trouble during the removal process. If you do not want to remove Searchsquared Toolbar yourself, you can scan your computer with the automatic tool, for instance, SpyHunter. It will erase all the existing threats and prevent other ones from getting on the system. Find the unwanted extension and click Disable. Click on the new search provider and then select Set as default. Find the search engine associated with searchsquared toolbar and then click the Remove button. Open your browser and then press Ctrl+Shift+A. Select Add-ons and then select Extensions. Locate the unwanted extension and click the Remove button. Select the search provider icon which you can find at the upper part of your screen. Select a new search provider from the drop-down menu. Select an unwelcome search engine and click the Remove button. Launch your browser and then press Alt+F. Find the unwanted extension and click the trash button. Select Remove. Select Settings from the same menu. Navigate to Open a specific page or set of pages and mark it. Select Manage search engines… in the section Search. Click on the new search engine and click Make default. Select the search engine which you do want to keep on your system. Quick & tested solution for Searchsquared Toolbar removal.